Water systems and transport systems are two classes of systems that have over the years received a significant amount of attention. Initially, this research focused on how to design such water and transport systems. More recently, a strong research line is emerging with a focus on how to obtain the best performance for a given water or transport system, after it has been designed. For both water and transport systems, at an operational level, approaches have been proposed in the literature aimed at optimizing performance at a day to day, hour to hour, or even minute to minute time scale. Nevertheless, approaches that consider the interaction between these two types of systems are lacking. However, at such fast time scales, to interplay between the two types of systems cannot be ignored. It thus becomes important to explore to what extent transport and water systems interact at an operational time scale, and how the dynamics of both systems can be aligned in the best way possible using operational control techniques. This is the focus of this book. In short, design and control of systems for transport of water (such as river systems, open canal networks) have gained increasing attention due to changes in local land-use, climate changes, and the need for energy savings. In order to take into account a variety of different objectives, methods for control of systems for transport of water are being proposed. Besides the safety objective typically considered, navigation is another objective that is often relevant for such systems. 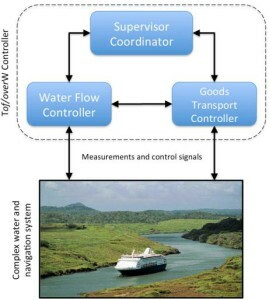 At the same time and for the same reasons, design and control of systems for transport over water (e.g., navigation systems, vessels, barges) are gaining increasing attention. As the volume of goods to be transported in the near future is expected to continue to rise, and as transport over water is the most environmentally friendly mode of transport, the need for innovative transport over water systems is apparent. In order to obtain the best performance, such transport systems should take into account the particular dynamics and behavior of the underlying water transport systems, which facilitate that transport over water. 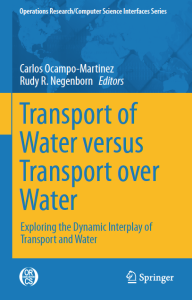 This book aims at stimulating discussion between researchers from leading international research institutes working on state of the art approaches for transport of water on the one hand and researchers working on state of the art approaches for transport over water on the other hand. Besides this, the main contribution of the book as a whole is to present novel perspectives ultimately leading to the management of the envisioned unified management framework taking the recent advances form both worlds as a baseline. The book is now available via Springer.